As a defective car seatback injury lawyer in California, I have seen, first-hand, how this serious product defect can cause injury or death. 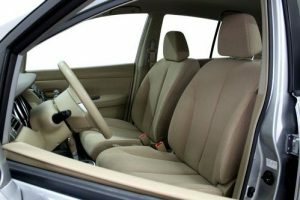 According to experts, defective seatbacks in some cars can break or collapse in major accidents, particularly rear-end crashes, causing paralysis or death to the occupants. They say that the seats might not provide protection for anyone in the car, including children, even if the car has a five-star rating. Crash tests show what could occur when defective seatbacks collapse in major crashes: The driver flies backward, slamming into the face of the child sitting behind. An average of three children die and 470 are injured in car accidents every day, and 11 percent of them were sitting in the back seat. This was the case for a 16-month-old girl in 2010, when a vehicle rear-ended her family’s new Honda Odyssey at 55 mph. The girl was secured in a car seat behind her father, but his seatback collapsed, striking her in the face and killing her. CBS News found in an investigation of its own that nine kids have died in similar accidents. Drivers and front-seat passengers are at risk for injury as well because their heads slam into the back seat when their seatbacks fail. A 70-year-old woman was paralyzed in 2011 when a vehicle rear-ended her 2002 Dodge Caravan and her seatback broke. The families of the little girl and elderly woman settled lawsuits against Dodge and Honda. The carmakers maintain that their vehicles are safe, meet or exceed safety standards, and are built better than in years past. The collapse of seatbacks happens every day, auto collision expert Alan Cantor told CBS News. The investigators hired him and his lab to test seats according to federal safety regulations. The test involves putting a brace on the seat, connecting a winch and pulling on it. Cantor and his team found that while car seats meet or exceed the requirements, they can still break. He also noted that this is something automakers and the National Highway Traffic Safety Administration have known about for more than 20 years. The NHTSA was warned in 1992 about the major and fatal injuries that collapsed seatbacks cause. Crash test reports even showed that defective seatbacks could collapse in rear-end impacts at just 30 mph. That same year, crash investigator Ken Saczalski told “60 Minutes” that the federal standard was inadequate. In response, the agency said it was looking into ways to improve the standard. In 1996, an engineer working for General Motors gave a deposition, admitting that the company started securing crash dummies to seats during crash tests because the cost of losing them was high. Another deposed engineer said that making the seats stronger would not be expensive. Then in 2000, the NHTSA administrator at the time told CBS News that they were investigating the issue within the year. She noted that using a 30-year-old standard was inappropriate. However, the agency stopped its investigation in 2004 because it lacked sufficient data to make changes, so the standard remains the same in 2016 as it was in the 1960s. Time is of the essence when defective car parts cause injuries and deaths because the parts must be preserved and tested to provide evidence that they were the cause. Contact an attorney immediately if you or someone you know was injured or killed by a defective seatback.